Open/Close Menu Hei Matau is a Maori carving design that is in the shape of a fish hook. The Maori make beautiful necklaces, pendants, and other types of jewelry with this design. On this page you will find a list of facts about the Hei Matau. This information, written for kids and adults, includes why this symbol is important to the Maori people, what materials Maori artist use to create Hei Matau jewelry, and where you can buy beautiful Hei Matau jewelry. The Hei Matau is traditionally made from bone (whale bone) or jade (greenstone). Hei Matau carving designs range from very simple to very ornate. This design has several meanings to the Maori including prosperity, strength, land, fertility and safe voyage over water. The design also represents the importance of fishing to the Maori. Many people who live in New Zealand regard this design as a symbol of their country. It is worn by both Maori women and men and is considered a cultural treasure (taonga). There are many online stores that offer Maori jewelry, including Hei Matau jewelry, for sale. Many of these stores offer cheap non-traditional products. Often these pieces are produced in China or India and are made from resin, plastic, or a bone paste. For traditional, high quality, and genuine Maori jewelry, including Hei Matau carvings you should visit The Bone Art Place. As mentioned above fishing was very important to the Maori. The Maori regarded fishing as tapu (a sacred activity) and there were rules dictating when they could fish and how fishing nets should be made. The fishermen would release the first fish they caught to please the god of the sea, Tangaroa. They also tried to please Tangaroa through prayer, rituals and talismans such as the Hei Matau which they hoped would protect them on fishing voyages. As mentioned above whale bone has traditionally been the main material the Maori used to carve fish hooks. The Maori also used bone from other animals such as cattle, birds, and dogs. Modern day laws put in place to prevent whale hunting have made whale bones scarce and therefore cattle bone is usually used instead. Pieces made of whale bone are highly valued. Maori carvers can still obtain whale bone from beached whales. In New Zealand the Maori have legal rights to the bones of beached whales. Hei Matau Carvings made from greenstone (New Zealand nephrite jade) are even more valued than whale bone for the Maori. Greenstone has spiritual significance for the Maori and is a highly-valued material. 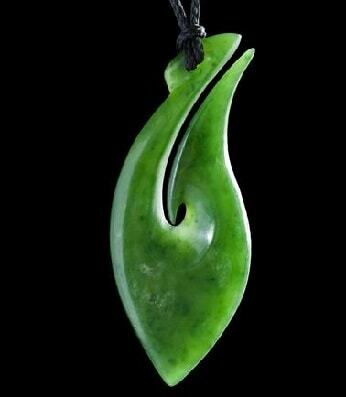 This jade is extremely hard and the fact that the ancient Maori craftsman could carve it into beautiful works of art is an amazing accomplishment. The Maori valued greenstone so highly that items made from this material were often passed down from generation to generation.